Alfa Romeo advertising: the 1970s. Alfa entered the 1970s with a lineup largely carried over from the 1960s. They also entered the 1970s with an overall win in Trans-Am racing, confirming the "race bred" image they gave their cars in the 1960s. Mechanical improvements were made to keep up with the competition, a notable one being SPICA fuel injection standard in all U.S.-market cars. 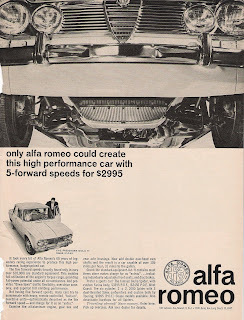 Let's look at what Alfa had up its sleeves during this decade and how they sold it. "We feel families deserve the same special handling racing drivers demand." This 1970 Berlina ad describes the Berlina as a four door race car safe enough to carry a family. It can come to a complete stop in a straight line from 60mph in less than 150 feet, which is "faster than every car sold in the U.S. save one limited-production import at more than twice the price." Which import they are referring to is not named. 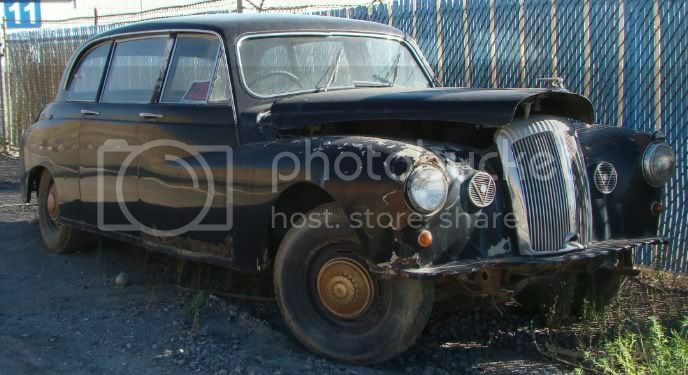 At the time of print the Berlina cost $3,795 on the east coast and $3,855 on the west coast. Small price to pay for a car with "steering as fast as your reflexes." "You haven't really driven yet. Until you drive an Alfa Romeo 1750." Alfa emphasizes their cars' performance aspect in this ad. Their US lineup is powered by the famous 1750 engine (1779cc) and Weber carbs are a thing of the past in the 1970s, replaced by a "race-proven [SPICA] fuel injection system." "Horst took Lime Rock, Gus won Bryar and Bert captured Donnybrooke to keep Alfa Number 1 in the Championship standings." This isn't an Alfa ad but an ad for Champion spark plugs. 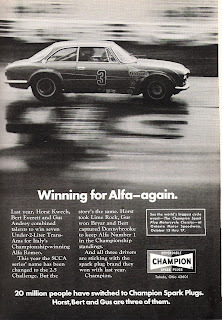 It is featured along with Alfa ads because it uses Alfa's success in Trans-Am racing as a way to advertise their plugs: three of Alfa's winning drivers had Champion plugs screwed into their car's cylinder head. "You should be impressed, but not surprised." 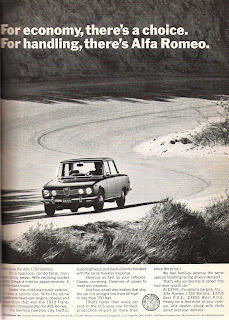 This 1971 ad for the 1750 GTV uses the race-inspired handling as the main selling point. It draws a comparison between the 1970 Trans-Am winner and the car featured on the ad and ends by saying that "if this kind of handling is good enough for our racing cars, it's good enough for you." When this ad was printed the 1750 GTV cost $4,795 on the east coast and $4,855 on the west coast. 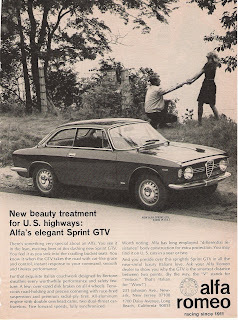 A small historical note: the ad mentions that the GTV will handle twist and turns in the road "without even breathing hard." In the early 1970s Subaru used a variation of that line ("at 70mph it doesn't even breath hard") in their own ads in an effort to diffentiate themselves from other economy cars, most notably the Beetle. "It all makes the Spider something very special." Much like the GTV ad above, this one's main point is the Spider's handling. It feels secure over any surface and through any corners one can throw at it. Not only does it handle splendidly, the ad claims, but the driver is "in command of the same double-overhead-cam engine, chassis and suspension that won the 1970 Trans-American Championship." All this for a mere $4,595 on the east coast and $4,655 on the west coast. "If the new 2000 isn't perfect, we're certainly getting better." The 1750s are out and the new 2000s are in. Autoweek sang the 1750's praises, billing them as "nearly perfect." Alfa thinks it has made considerable improvements with the 2000 series: more horsepower, more torque and an available limited slip differential. The 2000 GTV retails for $5,249 on the east coast and $5,299 on the west coast. Note the price difference between this 2000 GTV and the 1750 GTV above. "You'd expect an Alfa Romeo to cost more than a BMW or a Porsche. Several years ago, it did. But then came the devalued lira." 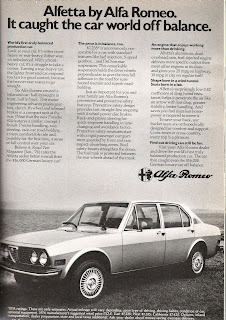 This 1977 ad brags that the Alfa GT has more standard features than a BMW 320i and a Porsche 924 but costs much less due to the economic woes Italy was experiencing in the late 1970s which lead to a devalued lira. The standard features the GT has over the competition include a 5-speed transmission, an all-aluminum engine and double overhead cams. "Visit your Alfa Romeo dealer. There may never be a better time." The text in this 1977 ad is fairly similar to the text in the previous ad - some of the sentences are carried over word for word. It mentions the bit about the devalued lira but makes no comparison to BMW and Porsche. Instead, it lists what it calls "6 engineering achievements in Alfa Romeo, bred in 67 years of world class racing competition." These are an all-aluminum engine, double overhead camshafts, mechanical fuel injection, DeDion independent rear suspension, four-wheel power disc brakes and a five-speed gearbox. "The equal front/back weight distribution gives it a stable handling." 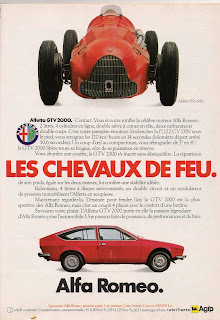 This 1978 Alfetta ad comes from a French magazine. Not being able to take advantage of the lira/dollar exchange rate Alfa instead puts forth its racing heritage. The 1950 Alfetta 159 is featured more prominently than the GTV 2000 it is advertising. It lists specs of the car, such as its ability to reach 120km/h (75mph) in 14 seconds flat. This ad still lists "double carburetors" as standard equipment, marking a difference in emissions regulations between the European market and the U.S. market. 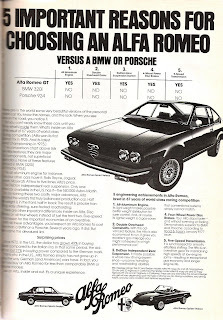 "Road Test magazine rates the Alfetta sedan overall better than the $16,000 German luxury car!" 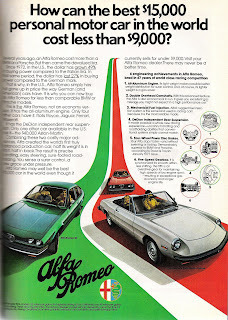 This rather lengthy 1977 ad is meant to convince a car buyer that an Alfa is the right purchase to make. Ample space is given to the text which goes into great detail about the Alfetta's handling (with the 50/50 weight balance) and as always the car's standard equipment/price ratio. 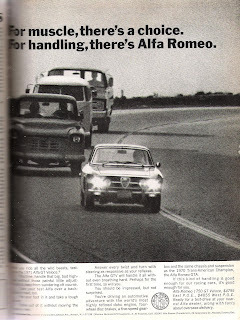 Alfa mentions safety in this ad, something they have not always done in the past. They boast a "rigid passenger compartment guarded by front and rear impact-absorbing zones", among other features. 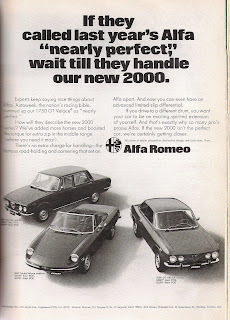 The ad also talks the Alfetta's "0.42 coefficient of drag" and the orthopedically designed seats. Photo credit: all ads were scanned for Ran When Parked out of period documents. Email us at ranwhenparked -at- hotmail -dot- com for high-resolution scans. The city of North Salt Lake has been mentioned previously on Ran When Parked. A November 13th, 2007, article defines the city as “a mildly depressing place dotted with refineries, factories and construction businesses.” Unfortunately things have not improved since, one could even argue the opposite. However, the city has again given us a rare find: a Daimler DR450. The Daimler DR450 came out in 1961 and was essentially a much longer and much heavier limousine version of the Majestic Major sedan introduced in 1959. Its name hints at the 4561cc V8 with hemispherical cylinder heads that lurks under the hood. The engine was carried over from the Majestic Major mated to an automatic transmission. The Majestic Major was a fairly luxurious car but the DR450 took it to new heights. It had all the equipment one would expect from a limousine including a glass separation between front and rear compartments, a middle row of jump seats and a back seat bigger than your average sofa. Wood paneling was standard all around and the dash included a complete set of gauges. To simply state that this car is big would be an immense understatement. This car dwarfs a w126-series Mercedes-Benz S-Class. Let’s put it into perspective: a w126 560SEL (the long wheelbase model, mind you) is 203 inches (5160mm) long and weighs 3,980 pounds (1,805 kgs). The DR450 is 226 inches (5740mm) long and weighs a hefty 4,650 pounds (2,109 kgs). Despite its weight the V8 managed to quietly and comfortably propel the car to a top speed of over 110 miles per hour. Production ended in 1968 after 864 cars came out of the Coventry factory. It was replaced by the Jaguar-based DS420 limousine. The car photographed above and below is for sale. We have no relation to the seller, it merely caught our attention on the side of the road in rush hour traffic. It's missing the engine, the transmission, the bumpers, the rear bench seat, two gauges and a title, though applying for one would be a quick and painless process in Utah. It has some rust but it just came out of a storage unit so it doesn't have the cancer that a car sitting outside would have. The seller is not clear on what year the car is. Contact us if you are interested and we will give you the phone number that is written on the car. The PRV engine is indeed controversial. Many Volvo enthusiasts will insist it was terrible and reference the bullet-proof "red-block" four-cylinders, while many French car fans will claim it wasn't so bad, and after all, a PRV powered Peugeot reached 253 mph at LeMans. DeLorean owners have often lamented that the engine claimed the life of their DMC-12 in a devastating self-destructive blaze, while those who owned PRV powered Dodge Monacos or Eagle Premiers probably didn't care enough about their cars one way or another. 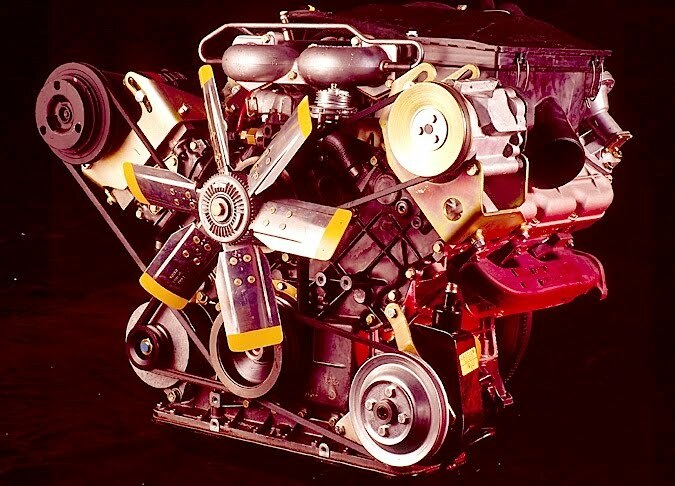 In spite of its many applications and long production run, the PRV engine was in many ways, a compromise. Originally, the Peugeot-Renault-Volvo alliance was to design a V8 for their more high-end cars. However, the great "Gas Wars" of the 1970s led to the first compromise - adoption of a V6 design instead. As a result of already having started work on a V8 design by that time, the 90º architecture of carried over to the V6 - a second compromise. 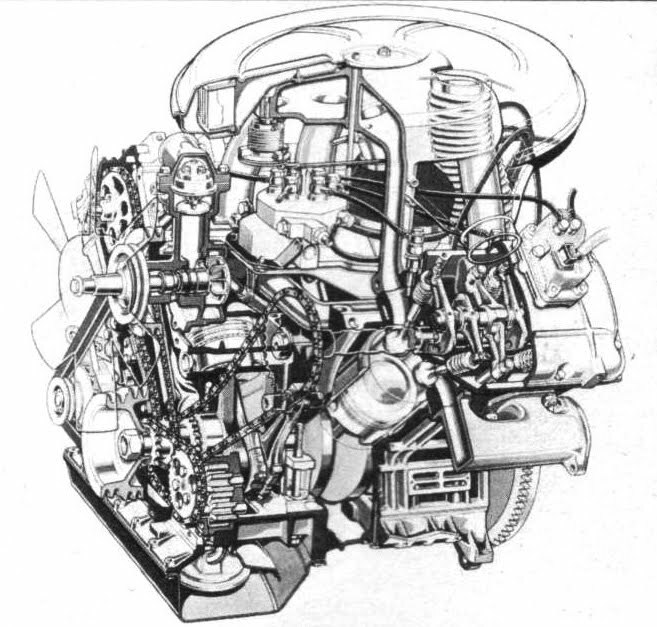 Furthermore, another compromise was chosen to solve the uneven timing generated by arranging the 6 cylinders at 90º as opposed to the more logical 60º format of most V6s. 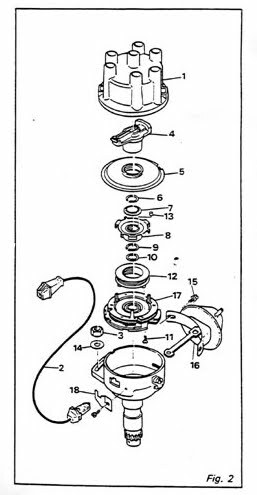 This was the initial choice to use uneven ignition timing, or, "odd firing" rather than more complex split crankshaft journals. Technologically these "compromises" led to a rather interestingly designed engine. Though the execution of the Franco-Swedish engineering that went into the lump wasn't always of the highest standards, we can only assume that they meant well. So, let us examine what lies beneath the hoods of so many European (and some American) vehicles produced between 1974 and 1998. To start off, the somewhat confusing geometric issues surrounding the PRV's design should be explained. With any engine having an odd number of cylinders across a geometric plane, an inherent balance problem arises. (For the sake of discussion, let us assume that we're only talking about 4-cycle engines here.) 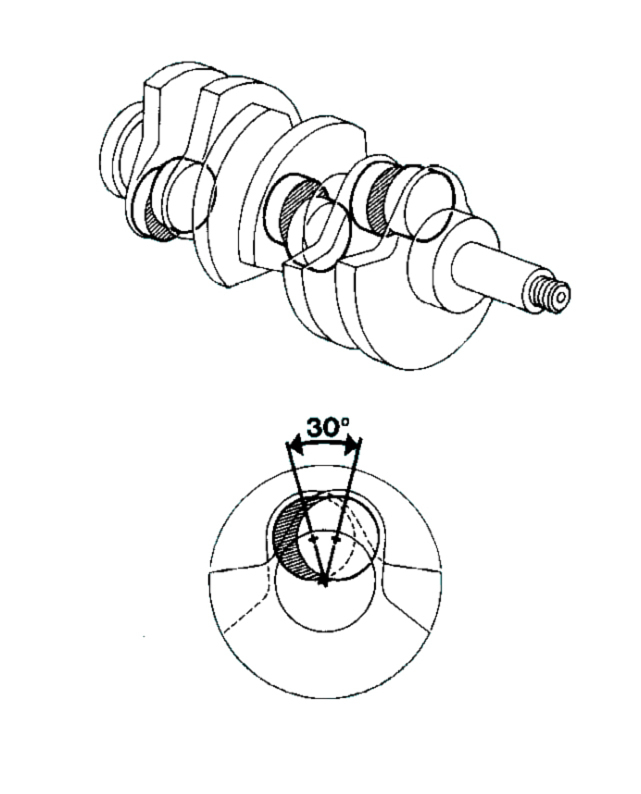 For a single piston to complete one full cycle (intake, compression, power, and exhaust) the crankshaft which it connects to must rotate two full times making a total of 720º. 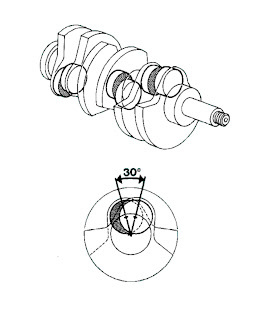 Since the power stroke obviously puts the most torque or "power" on the crank and the other strokes actually use power, there is a significant imbalance generated in the rotation. With the addition of a second cylinder to the process, the imbalance is counteracted by another cycle during which the power strokes are opposite of each other. The 90º V8, is therefore inherently smooth because every time a cylinder fires, the "pulsing" tendencies of a reciprocating engine are reduced. Not only is there a balance from side-to-side between the cylinder banks, but also from front-to-back due to a grouping of four cylinders along each geometric plane. (there are cross-plane crank and flat-plane crank V8 engines, but that, of course, is another story) In the case of our PRV engine, we can see why the 90º angle was chosen when it was originally planned as a V8. With any V6, the aforementioned balance issue arises due to there being three cylinders across each plane, but in the case of a 90º V6, a problem with timing arises as well. 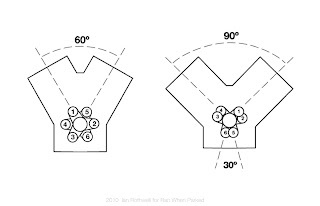 There are groupings of two cylinders separated by 90° of rotation, and groups separated by 150° of rotation, thus causing a firing imbalance. 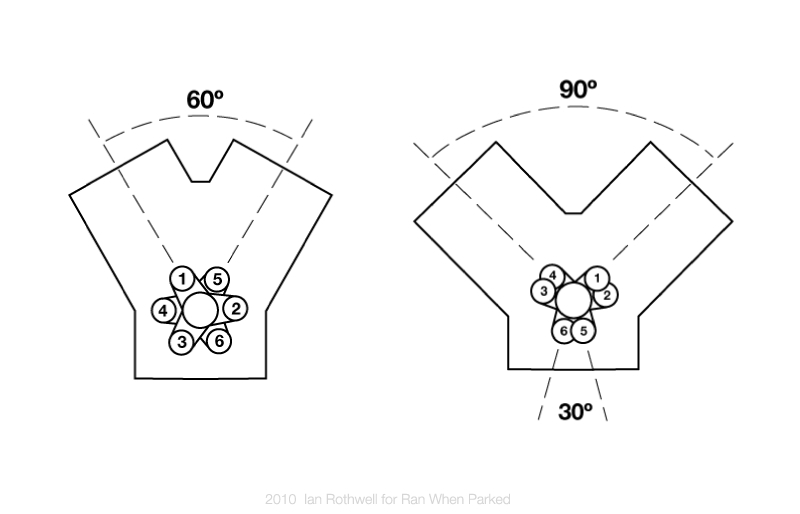 In a V6 engine, the ideal angle is 120º since the rotation of the crankshaft must be divided into thirds in order for two cylinders to share a crank journal. At this angle, the ignition timing is "symetrical" and the cylinders fire at 120º increments of crank rotation. Since such a wide angle is generally not practical for many applications, it's most common to find 60º V6s which, for the same reasons of timing and balance, is nearly as preferable. To adopt the six cylinder format to an existing 90º block design, the journals of the crank could be splayed or split by 30º, which can be difficult to engineer since it can weaken the crank and also requires rather complex and more expensive machining. Alternatively to split journals, an "odd" firing order can be adopted to ensure each cylinder fires at its optimal point, regardless of the position of its 'mate' cylinder. This is not necessarily the optimal solution in terms of smoothness, however it is cheaper. It would not be until a full decade after PRV production started that the second generation of the design appeared with split journals in 1984. Fuel delivery wasn't any more simple on the PRV. 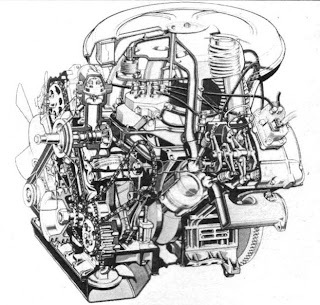 Engines, such as those used on some Peugeots, used two different Solex carburetors attached to a single manifold. One carb was a single-barrel which supplied fuel under light loads and idle. A second dual-barrel then supplied the bulk of the mixture, having each barrel serve mostly one bank with a cross-flow channel between them. The single barrel acted as sort-of the "control" carb, and the double barrel was actuated via diaphragm. Many owners have opted to convert to Webers, or other less troublesome carbs. 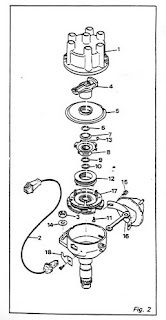 The PRV came in a variety of displacements ranging from 2.4 to 3.0 litres. Peugeot and Renault in particular were the most active parties in the partnership in terms of modifying the design over the years. Renault turbocharged it, and Peugeot developed 24-valve variants. The 24-valve versions in particular were known for cam and tappet wear unfortunately. A bit of success came in the form of the WM Peugeot P88 sports racer. It developed over 900hp (up to 950 hp) with dual overhead cams and turbocharging - taking the car to the 253 mph course speed record at LeMans that year. V6 block comparison illustration I.R. Rothwell 2010 - other illustrations and photos are modified from period technical illustrations. Along with a new article on Alfa advertisement that you can find below, we have finally gotten around to updating our display case page dedicated to scale models. You can find it in the right hand column under the "pages" header or by clicking on this link. And, join our Facebook page to discuss some of the cars we feature and to find miscellaneous photos and vintage car ads that we don't post here. 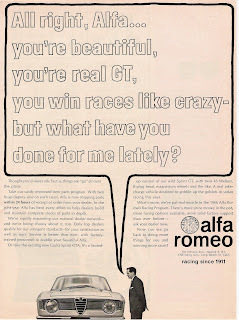 Alfa Romeo advertisements: the 1960s. 2010 marks Alfa Romeo's 100th anniversary and we thought an original way to celebrate it would be to dive into our archives and look at Alfa advertising over the years. Below is the first part of the series, the 1960s. "Alfa Romeo has won more Grand Prix Championships than any other marque." This Giulietta Spider ad was printed in 1961, the same year Alfa started importing cars to the U.S - Max Hoffman imported them prior to that. It explains that Alfa's expertise in racing goes into developing their cars and gives an overview of their lineup, including who designed the cars. The small print at the bottom reminds potential buyers of Alfa's overseas delivery plan. "Now can we go back to doing more things for you and winning races?" 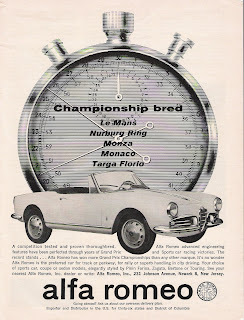 This 1966 ad features a Sprint GT but is focused on the Alfa Romeo company as a whole. The text summarizes the improvements that they've made in customer service such as shipping parts within 24 hours of receiving an order. To make servicing the cars easier they have added new dealers that went through a rigorous selection process. 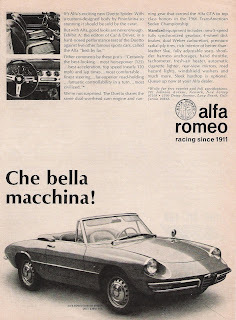 The ad features the "racing since 1911" slogan that can be found on most 1960s Alfa ads. "The result is a car capable of over 105 miles per hour; 31 miles to the gallon." In 1966 Alfa billed the Giulia TI as a "high performance, budget-priced car". The ad places it above the competition by mentioning some of the standard equipment that other companies feature as extra-cost options, such as a five-speed transmission, disc brakes and individually adjustable front seats. The end of the ad lists other cars in Alfa's lineup and makes a mention that detachable hardtops are available for all Spiders. "By the way, the "V" stands for "Veloce." That's Italian for "Wow!" 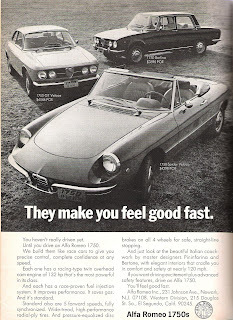 The selling points Alfa uses in this 1966 GTV ad are similar to the ones in the Giulia TI ad above. It goes over the features that enable the GTV to stand out in its class: standard disc brakes, a fully-synchronized five-speed transmission and dual overhead cams, to name a few. The ad ends with a note to visit your nearest dealer and have them show you why the GTV is "the smartest distance between two points." "With Alfa, good looks are never enough." The Duetto was making its debut on the U.S. market when this ad was printed in 1967. 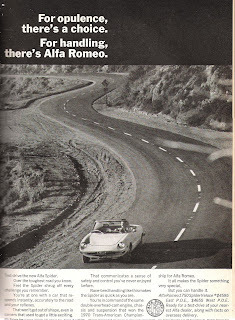 The car had previously been featured in a comparison test by Car & Driver and Alfa references it in the ad, quoting positive things said about the car such as "the most comfortable" and "far-superior road-holding." A "sleek hardtop" is an available option. "You'd do well to end up at your Alfa dealer for a test-run." 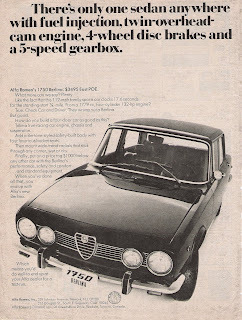 Alfa again draws on their racing heritage for this 1969 Berlina ad. The first part of it boasts that the car's 112mph top speed is achieved thanks to a "true racing-car engine". Next they talk about the Bertone-styled exterior that they blended with a luxurious interior, making the Berlina a unique vehicle available for $1,000 less than its competitors. 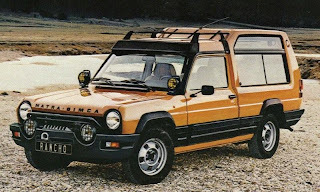 A quick look at the Matra-Simca Rancho. There is a traditional recipe in France called pain perdu, a name which literally translates to “lost bread”. In the old days it helped families cook a last minute meal by putting together the ingredients they had lying around, namely sugar, eggs, butter, milk and often-stale bread. The result is a slightly more elaborate but delicious version of toast. Philippe Guédon, a Matra engineer, called the Rancho “the pain perdu recipe applied to the automobile.” He had a point: the car was thrown together from miscellaneous bits and pieces from the Simca parts bin. Starting out with a Simca 1100 VF-2 body, designers added brakes from the Simca 1100TI, an engine from the Simca 1308GT and the gearbox from the Simca 1307. The Rancho’s body was built out of polyester and fiberglass, making it fairly light. The designers hoped the end result would be a fun, practical vehicle similar to the Range Rover but accessible to a much wider public thanks to a lower price. In 1978, a new Rancho cost 35,995 francs while a Range Rover could be had in exchange for 60,520 francs. It had all sorts of off-road goodies like plastic body cladding, fog lights with protecting grills, a small bull bar, an impressive roof rack and an available winch, just to name a few. 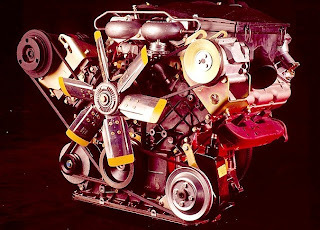 The engine was the 1308GT's 1,442cc four-cylinder installed transversally. A double-barrel Weber carburetor took care of fuel delivery and the whole unit was good for 80hp running on premium gas. Because of premium’s elevated price, an available option on the Rancho was a lower compression version of the engine that ran on regular gas. This lowered the power output to 78hp. The 4-speed manual transmission spun the front wheels and the front wheels only, marking the car’s biggest weakness. The car looked capable of climbing up a wall but it was strictly aesthetic. Matra experimented with a four wheel drive Rancho but had no money to develop it past the prototype stage. In the Rancho’s defense, the Grand Raid model featured a limited slip differential and the higher-than-average ground clearance of all Rancho models permitted them to get further down the trail than you would in a standard Simca 1100. 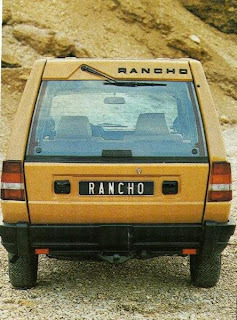 Several trim levels were available throughout the Rancho’s production. The Grand Raid came with more standard off-road equipment including a sump guard, a winch and a trailer hitch. 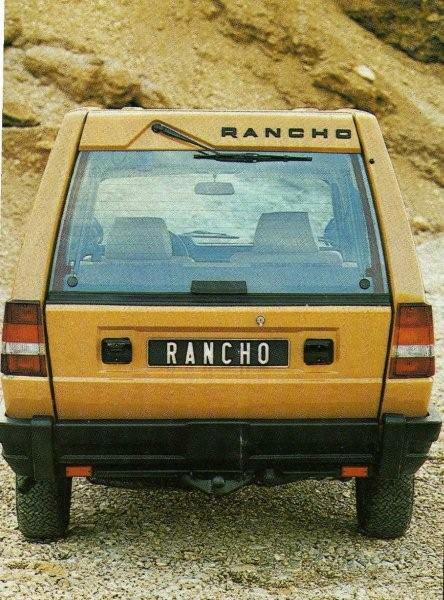 The Rancho X was a more upmarket model featuring a standard tachometer and tinted windows. The AS was for the French market only and had no rear seats in order to qualify it as a company car (company cars were taxed less). Lastly, a convertible version was introduced in 1981 but sales were poor and it disappeared from showrooms the following year. 1981 also marked the addition of two extra rear-facing seats in the trunk. Equipped with these seats the Rancho could carry up to six people, further enhancing the car’s practical side. 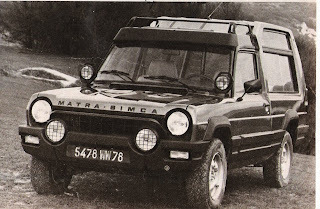 Due to Simca’s sale from Chrysler to Peugeot the car was rebadged Talbot Matra Rancho in 1982. The Rancho immediately became a popular car for families who lived in the countryside and/or families that needed the vast cargo space to carry camping gear and the like. It had few competitors on the European market. The more rustic Renault 4 F4 fourgonnette was available until 1988 but had less interior space and appealed to a different market. The 602cc Citroen Acadiane, available until 1987, also catered to a different, less-demanding public. 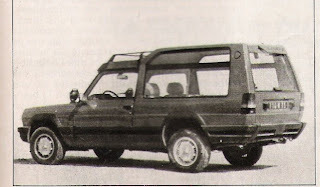 The Renault Express and the Citroen C15 (based on the Renault 5 and the Citroen Visa respectively) both arrived on the market after the Rancho was phased out and were more often than not purchased as panel utility vehicles, not family vehicles. In the planning stages Simca management hoped to produce 25,000 Ranchos. By the time production ended in late 1983 they had produced 56,457 of them, a clear indication of the favorable reception the public gave to the Rancho despite its lack of off-road ability. While some saw it as the answer to the question no one asked, a look at today’s car market in Europe shows numerous Rancho-like vehicles like the Citroen Berlingo and the Renault Kangoo. The Rancho was seemingly born in the wrong era. The Rancho also spawned an unlikely successor: the Renault Espace. 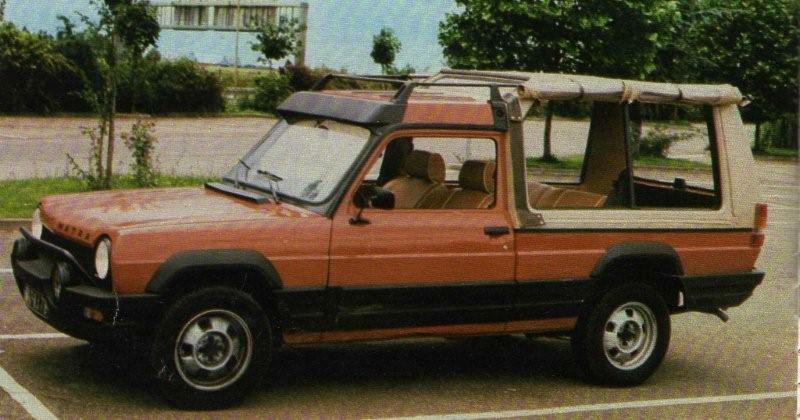 Matra wanted to replace the Rancho with their prototype of the Espace known as the "dessin orange", which translates to "the orange drawing" in English - both the prototype and the background it was drawn on were orange. It predicted the basic shape of the first Espace but only had three doors instead of five. Peugeot (who controlled Matra at the time) deemed the project too expensive and not promising enough. Determined to take its design to production Matra knocked on Renault’s door and they quickly adopted the project, one that upon its launch in 1984 arguably became the first European minivan and is in its fourth generation today. Peugeot's competitor, the 806, only came ten years later and has never been able to match the Espace's popularity. Photo credits: the black and white photos were scanned out of period documents for Ran When Parked. The color photos were found online and we take no credit for them.